•Within man's body there is a capacity for health. If this capacity is recognized and normalized, disease can be both prevented and treated. •The body's musculoskeletal system forms a structure that, when disordered, may effect changes in the function of other parts of the body. •Progress can be achieved in the study of disease if first a study is made of health. Since osteopathic medicine in the U.S. began more than a century ago, its principles and practitioners have become part of the medical mainstream. Yet despite its grounding in traditional medical education and practice, it is only within the last two decades that osteopathic physicians have achieved wider acceptance in the medical community and among the public. 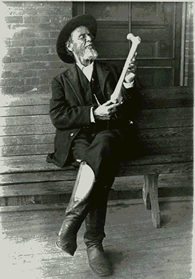 The origins of osteopathic medicine can be traced to one man, Andrew Taylor Still. In 1874, Still first articulated his ideas on improving the medical practice of the times. A.T. Still started his practice to care for settlers and Native Americans on the Missouri frontier. In this era, he saw the harsh effects of some of the diseases of that time, such as malaria, cholera, tuberculosis, and smallpox. But it wasn't until illness and death touched his own family that he began to develop a philosophy that resulted in a fundamental shift in the accepted thinking about health and disease prevention. In the spring of 1864, three of Still's children died from spinal meningitis and later, one from pneumonia. That personal loss provided the impetus for developing an alternative to the accepted medical practices of the day. Thus, a new discipline was born out of a spirit of reform and a rethinking of the focus on disease to a more patient-focused philosophy based on disease prevention and wellness. Still dedicated himself to an exhaustive study of the body's structure and function to see why it was capable, or incapable, of combating disease. He observed that abnormal blood and nerve supplies to the body (caused by some dysfunction or change in the musculoskeletal system) often were found in diseased or abnormal tissues or organs. He postulated that a physician could promote health and wellness by removing or changing whatever might be blocking the circulatory and nervous systems. Thus, the idea of manipulating the body to cure and prevent disease and chronic pain was introduced to America. Although this idea was just spreading in America, it was not a wholly new idea to the rest of the world. Hippocrates wrote about this in the 4th Century BC and it had also been utilized in ancient Asian and European societies. To describe this new science of healing, Still employed the terms osteopathy and osteopathic medicine. It is not clearly known when Still first originated these terms, but Still's philosophy of drugless, manipulative medicine was officially labeled "osteopathy" in 1885. In 1874, Still first presented his ideas to the medical community. The philosophy was not well received. He traveled from town to town practicing and perfecting osteopathic manipulation techniques. As word spread of the discipline's efficacy, Still's philosophy gained greater acceptance. In 1892, the first osteopathic medical school opened its doors in Kirksville, MO. Now known as the Kirksville College of Osteopathic Medicine, its original class had only 17 students, five of which were women. By 1897, the class grew to 500. Also in 1897, the American Association for the Advancement of Osteopathy was organized, later renamed the American Osteopathic Association (AOA). Shortly thereafter, new colleges of osteopathic medicine were founded in Boston, Philadelphia, Los Angeles, Kansas City, Chicago, and Denver. The first DO practitioner in Southern Arizona was Dr. George W. Martin, who opened his office in Tucson in 1900. By the time Still died in 1917, there were 5,000 DOs in practice in America. By 1935, the number of DOs in practice grew to 8,000; by 1955, there were 12,000 practicing DOs. By 1970, the DO numbers had grown to 15,000. Perceived and bra nded as a something "other" than medical doctors, DOs had to wait until 1973 to gain full practice rights in all 50 states. With today's interest in wellness, preventive care, and more cost-effective means of health care delivery, osteopathic medicine has become mainstream-- and more -- with its "whole person" approach to health. 1) Scott Johnson's book "Something More...Osteopathic Medicine in Southern Arizona"
2) Tucson Osteopathic Medical Foundation. 3) Dr. Norman Gevitz, PhD in The Journal of the American Osteopathic Association, Volume 114, Number 1-2. 4) The Museum of Osteopathic Medicine Website.